To describe Bryant Family Winery in a word it would be fair to say that it’s unique. From the building design to the wine it is very unique indeed. 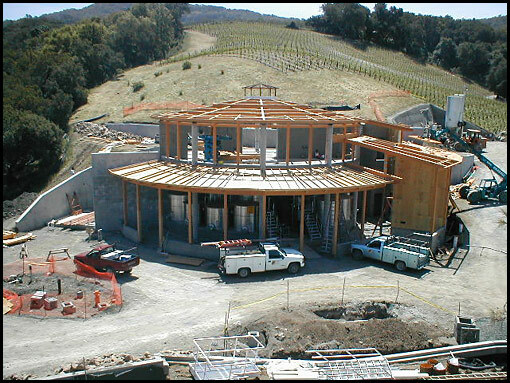 It should also be noted that the circumstances of construction are rather unique in that the architect of the winery is now the project manager for James Nolan Construction, the general contractor building Bryant Family Winery. Bryant Family Winery is located in the Napa foothills at Lake Hennessey. Bill Zeeb, Commercial Manager at LeDuc & Dexter, noted that the location of the winery has been a challenge for everyone involved in the construction project. “Because it is being built in a rather exclusive area with neighbors nearby, access to the site is tough. Tony Watson, who I’ve known for years, is doing a great job keeping things moving in and out and around the site, he’s like an orchestra leader.” Watson is the superintendent for James Nolan Construction overseeing the job site. Zeeb describes the plumbing contract at Bryant as, “straight forward”, but adds, “It’s a complicated project.” The winery building is adjacent to a mined cave that will serve as the barrel storage area, “The cave will give us a good temperature for the wine”, adds Burnham. The system that LeDuc & Dexter has installed for heating and cooling the winery structure consists of chilled or heated water that runs through a coil system and is distributed by electric fans. “It’s similar to a radiator with the heated water being pushed out by the fan, of course in the other case, the chilled water provides cooling temperatures.” LeDuc & Dexter is also installing all the process piping, cooling lines, gas and compressed air lines for the winery. James Nolan Construction also has LeDuc & Dexter working with them on another one-of-a-kind winery, Nickel & Nickel in Oakville. When the Bryant Family Winery is complete, Helen Turley, their highly regarded winemaker, will make only 2,500 cases of Estate Cabernet Sauvignon per year. Much the way James Bond ordered his martinis – shaken, not stirred, Bryant Family Cabernet will be gravity fed, not pumped, for fermentation and storage in the cave – quite unique.